Nineteen of the best. And thanks to Jewel for two cracking Nina Simone tunes. If you only listen to “To Love Somebody” and “Don’t Let Me Be Misunderstood” you won’t go far wrong. It’s been a while but here we are – 18 of the best by our favourite blues band. Peter Moore dropped in and gave us a couple of tracks – check out Cyprus Avenue. Also a cracking rendition of Gloria. If anyone knows the second track Peter did, let me know by comment here so I can update the track. So Ed mentions casually that a friend of his is dropping in and that he’s a great sax and harmonica player. Of course it being Ed’s usual understated style, we didn’t expect the treat we were in store for. 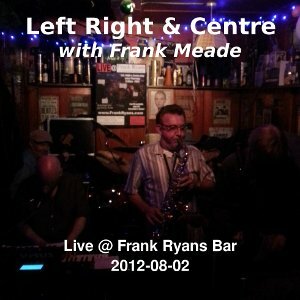 Frank Meade squeezed himself in the middle of the stage and we had a Guinness record for the smallest area you could shoehorn a five price band into. John Quearney was away this week so Garvin Gallagher substituted on bass. As they say – “a change is as good as a rest” and Garvin added his own unique flavour to our favourite blues set. Seventeen of the best. For the first time: St. James Infirmary. Updated 16/04/2011: I fixed an issue that was preventing people from downloading/playing individual tracks. According to Tadgh, Ed recorded a version of Louie, Louie with Richard Berry (writer and composer of the song) for the BBC. Sixteen tracks and the return of Trevor. Highlights this week: A long awaited Get Right Church and Like A Rolling Stone. Again work got in the way, so there is no recording of the Paddy’s Day gig. Delayed due to work, but here we go. Enjoy!